The whole unit is installed on a single, rigid skid. 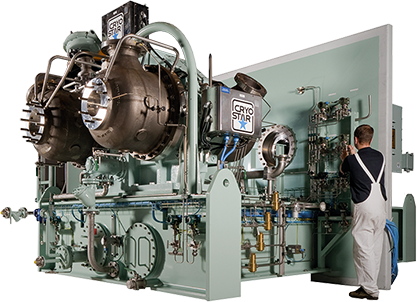 Typically this machine delivers up to 40,000 m3/h of boil-off gas with an inlet temperature of -140°C at a delivery pressure of 2.03 bar a. Typical applications include cargo handling or tank maintenance. Electric motor driven, two-stage cryogenic compressor, type 2-CM, with variable diffusor vanes, complete with lube oil system, seal gas system, accessories and designed according to API 617 if required (with separate lube oil system). 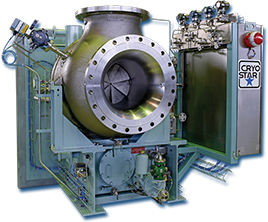 Typically this machine delivers between 2,500 and 6,000 m3/h of boil-off gas with an inlet temperature of -120°C, at a delivery pressure of 6.5 barA. The whole unit is installed on a single, rigid skid. Typical applications are fuel gas supply, reliquefaction plant feed or BOG recondensing. Electric motor driven, four-stage cryogenic/warm compressor, with variable diffusor vanes on first stage, complete with lube oil system, seal gas system, accessories and designed according to API 617 if required (with separate lube oil system). 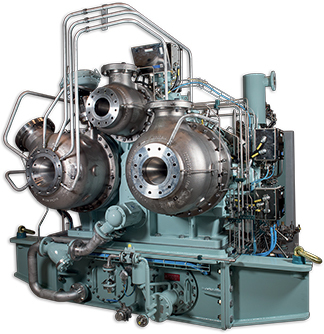 Typically this machine delivers up to 5,500 m3/h of boil-off gas with an inlet temperature as high as -20°C, at a delivery pressure of 6.5 barA. The unit is installed on a single, rigid skid. Typical applications are fuel gas supply or BOG recondensing. 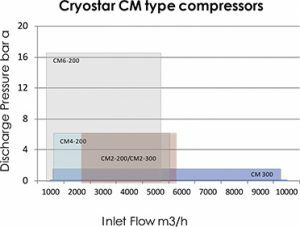 Electric motor-driven multi-stage cryogenic/warm compressors equipped with variable diffuser vanes on first stage. These units are supplied with lube oil and seal gas systems, on-skid and field instruments, or to API 617 with separate lube oil system, if required. Wide operating ranges are suitable for fuel gas feed for low pressure 2-stroke marine engines.